The economy is not able to generate enough jobs in the formal sector to handle the large number of entrants…. Cambodia’s economy may be recovering from the global financial crisis, but experts point to continuing challenges finding higher-paid employment for the country’s young population. Some 65 to 70 percent of the domestic labour force is employed in subsistence agriculture, but with about 48 percent of the Kingdom’s population currently under 20 years old, according to the United States Commercial Service’s 2011 Doing Business in Cambodia Guide, demand for higher-paying employment is expected to only increase. “The economy is not able to generate enough jobs in the formal sector to handle the large number of entrants to the job market,” the report said. University of Cambodia business and economics lecturer Chheng Kimlong said the domestic economy’s absorption capacity for labour was limited at present. Some 20,000 to 25,000 students graduate every year, often facing trouble gaining suitable employment. “The demand for [skilled] labour is not very high, and people compete for fewer and fewer jobs,” he said, adding much of the employment available at present was for unskilled workers in growth sectors such as garments and agriculture, where wages tend to be low. Cambodia’s garment industry was hard hit by the world economic crisis. During 2009, the Ministry of Commerce had estimated 70,000 workers lost their jobs and 70 factories closed their doors. But the industry, which accounts for some 85 percent of the Kingdom’s total exports, has shown signs of revival. Garment exports increased in value by an annualised 45.5 percent in the first quarter of 2011, ministry statistics show. With increased production, the garment industry has ramped up its demand for labour, according to the International Labour Organisation National Co-ordinator Sophorn Tun. “Employment has reached pre-crisis levels, with approximately 320,000 people now working in the garment industry,” he said. ILO figures show the garment sector was one major contributor to a 3.3-percent rise in employment across the Cambodian economy last year, with a total of 190,000 jobs being created. Some garment workers expressed strong job satisfaction. Houn Phama said she began work at Health Source Garment Factory one week ago. She had worked with her family as a farmer, before moving to Phnom Penh a year ago to work as a hairdresser. However, that employment had not earned her enough money, much of which she says she sends to her family. After starting at the garment factory, her income has risen. “I now earn S$61 per month, and want to work here forever,” she said. However, other workers said they were keen to pursue more lucrative employment, though added they faced many challenges seeking jobs with higher wages. “I would like to go back to school, but I can’t afford it,” said Sokhat Soupaou, a 21-year-old garment worker at the same factory. “I need to support myself and my family back home. I have no hope of getting promoted as I don’t have the knowledge or the skills,” she said. 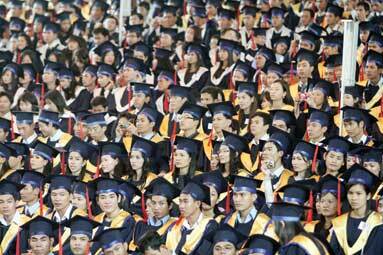 While the high number of unemployed graduates may be a problem, the ILO’s Sophorn Tun said the main challenge facing the domestic labour market “is to provide a competent work force”. “The ILO is trying to assist the government in addressing productive employment for the estimated 300,000 youth expected to enter the market [per year],” he said. Improving the skill sets of Cambodian labourers is a gradual process, but could ultimately pay benefits to the workers, and to businesses, which often cite an underdeveloped labour market as a hurdle to further economic growth. Organisations such as Society of Human Resource Management and Productivity work within manufacturing industries to improve productivity and improve the skills of floor operators. “We attempt to improve local workforces, providing workers with the skills to apply for mid-management positions, of which 80 percent are currently taken up by foreigners,” said SHRMP Director Mona Tep. The organisation tends to target unemployed, high-school educated workers. Workers with less education and less money are often at a disadvantage to improving their skills, she said. “Our three-month classes cost $500, which unfortunately, informal and low-skilled workers cannot afford. We did offer evening classes, but some workers lack confidence in their abilities and are unaware of potential opportunities,” said Mona Tep. Although opportunities exist higher up in the garment sector, experts highlighted several other industries as providing opportunities for higher-paying work. The tourism sector, which saw 15 percent growth last year, according to United Nations Economic and Social Survey of Asia and the Pacific 2011, now requires more highly qualified employees, Cambodian Hotel Association President Luu Meng said. He added that as the standard of employers improved, it was only natural that the average wage increased in tandem. Another sector that appears to be gaining momentum through its appeal to a younger generation is the advertising industry, according to Kevin Britten, CEO of higher-end recruitment agency Top Recruitment. Britten stated industries such as advertising could take off due to their appeal, but he said the government needed to provide training to young workers so they could compete for work in these emerging sectors. But for workers at the lower end of the labour pool, some say they see the answer outside of Cambodia. In the case of young garment worker Phorn Sreythoch, Korea offers better prospects.